Hey guys!! I am back with another review for the Citrus Clear Line. I’ve reviewed their products before, so it is a brand I am VERY familiar with the line. So let me jut jump right into the review. I am going to start with the Natural Tahitian Lime Sensitive Wash. I used this was before in the past, and I LOVE it. the smell is so potent but in a good way. The lime scent is so divine. I like How my skin feels very smooth but not stripped. The next item is the Grapefruit Acne Spot Treatment. Now I know grapefruit is rich with antioxidants and vitamins, so was very excited to try this out. Now I don’t frequent breakouts, but when I do I like to have a spot treatment on hand. This one is actually really nice. It dries up my pimples really fast which makes it a lot quicker for them to go away. The Tangerine Tingle is a 2 for 1. You can either use it as an exfoliating cleanser or as a mask. I used it both ways. As a cleanser, its great, it is exfoliating so it is stripping, but it is expected. As a mask, it wasn’t ok. It is more of a hydrating mask if you do it while you are in the shower, so it really helps open up you pores and get deep into the skin. Did I forget to mention the smell?? Well, it is bomb.com! Out of everything this one smells THE BEST! Now I love a good mask and the Pore & Blackhead Extracting Mask is EVERYTHING! This is a DEEP mask, so I would not recommend doing it the day or week of a special event or wedding, because this literally pushes everything that is deep in the skin to the surface. So I will caution you on that part. The smell isn’t amazing, but it performs as it says. Lastly is the Pink Grapefruit Sensitive Moisturizer. I have been enjoying this one. It is very lightweight so it is great under makeup. Even though it is lightweight it’s still moisturizing. Grapefruit is also high in Vitamin C and has anti-aging properties so it has amazing benefits as well. Overall, Citrus Clear has yet to disappoint and this review is no different. The products are great and the price point comparable to other lines. Their line is free from harsh chemicals. 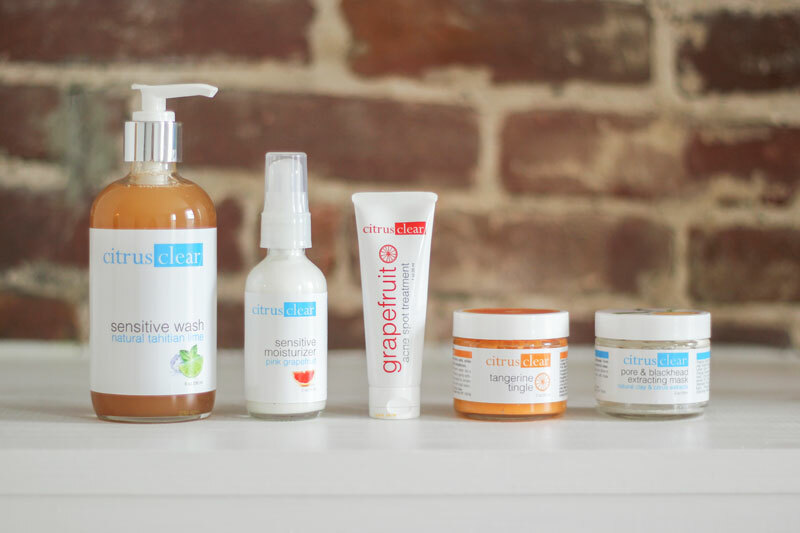 Please make sure to check out Citrus Clear for some amazing natural skin care products .